If you buy aged domains, for your Private Network, client or new niche sites, you will LOVE this tool... When you are searching for aged domains, you look at their statistics, right? Their SERPed Rank, age, Ahrefs Domain Rank, Moz Domain Authority... That's great, but it still doesn't completely protect you from buying weak domains. What if the statistics are not up-to-date? What if all the best backlinks have just been removed? These statistics are also easy to 'inflate' creating a bunch of non-related backlinks. What you need to look at is the backlink profile of each domain you are considering buying. Imagine a tool that analyzes the statistics of their backlinks... Imagine being able to see their SERPed Rank, Ahrefs Rank, Ahrefs Domain Rank, IP address and more... That's exactly what 'Backlinks Explorer' does! 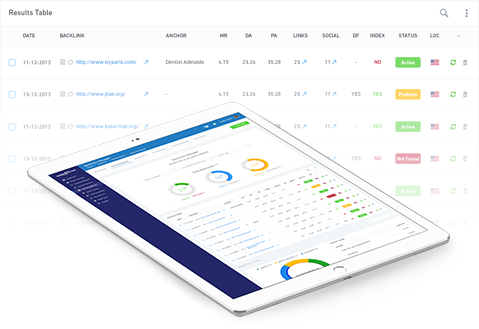 This tool doesn't just analyze domains, but backlinks too, so you can see if the statistics are in accordance with the reality. 'Backlinks Explorer' provides you with a SERPed Rank breakdown, domain age breakdown, Alexa Rank breakdown, B-Class IP breakdown, C-Class IP breakdown, list of links and anchor text cloud. You can even order links by Ahrefs Rank, Ahrefs Domain Rank, SERPed Rank, domain age, Moz Page Authority, Moz Domain Authority, IP address and so on, which makes it very easy for you to see what the strongest links are and if they are likely to stay or not. With 'Backlinks Explorer', you can easily see how strong or weak a domain is, from behind the scenes. You will never buy a weak domain again.